You can find the full lists of enhancements in the CMake 3.9 release notes. The latest preview has improved support for folders that contain multiple independent CMake projects. When you open a folder with independent projects, all targets in your CMake projects should be detected. This feature does have some limitations in the preview. For instance, if there is a CMakeLists in the root folder, independent CMakeLists in subfolders may not be properly detected. Please let us know if this will negatively impact your projects. Until then, you can work around this limitation by opening the subfolder directly. 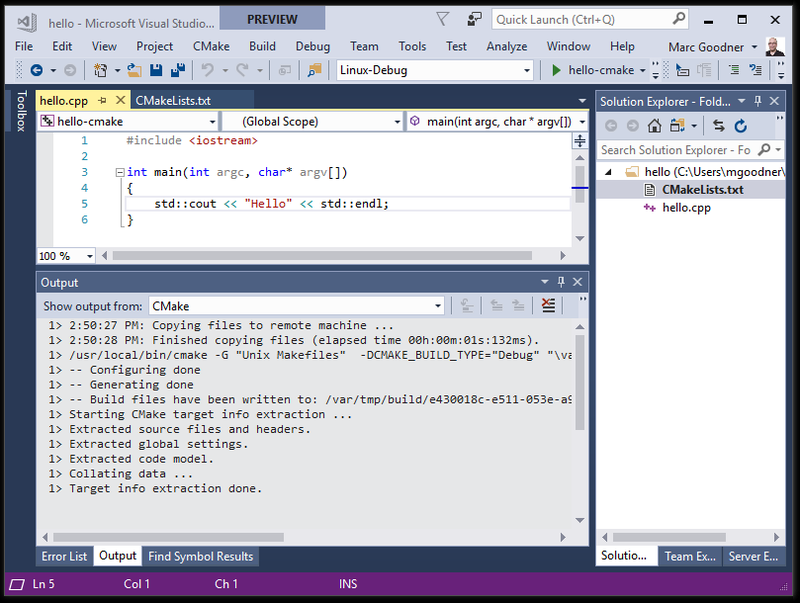 Visual Studio now supports targeting Linux directly with CMake. This feature allows you to open your Linux projects without modification, edit on Windows with full IntelliSense, and build and debug on a remote Linux target. Additionally, Visual Studio handles the connection to the remote target for you, so you don’t need to worry about setting up SSH tunnels. This should make cross-platform development a breeze, because you can switch between targeting Windows and Linux by switching configurations in the dropdown. Check out the link above if you want to learn more. Cannot build solution with CMake because generator could not be not found. CMakeSettings.json cannot be placed in the ‘.vs’ folder. Launch.vs.json doesn’t support properly support environment variables. CMAKE_VS_DEVENV_COMMAND variable is not set.